Media captionAre tumble dryers still a fire risk? More "creative" ways need to be found to warn people about fire-risk tumble dryers in their homes, according to an official review. Some 5.3 million tumble dryers under the Hotpoint, Creda and Indesit brands required modification after a series of fires, including a tower block blaze. Whirlpool, which owns the brands, sent out various letters, emails and texts in addition to an advertising campaign. Yet hundreds of thousands of machines are still thought to be in homes. "Whirlpool must reach affected consumers in more creative ways to minimise the risk of faulty machines still being in people's homes," a report by the Office for Product Safety and Standards (OPSS) concluded. Whirlpool estimates that between 300,000 and 500,000 could still be in UK homes three years after the first safety notice was issued, although there is no definitive register to judge the accuracy of the estimate. Fluff in the machine could be ignited by the heating element and cause a fire, so a fix by a trained engineer is required. The OPSS also said Whirlpool needed to improve its risk management and work on a more rigorous system of quality checks for modified machines. Consumer Minister Kelly Tolhurst said: "We will keep Whirlpool's actions under review to ensure they respond effectively and consumers are kept safe." In May last year, the BBC's Watchdog Live consumer programme uncovered cases in which machines had caught fire even after being fixed. Vicki Mudge and her sister-in-law, Jemma Greenslade, told the programme that they had to drag Vicki's burning tumble dryer out of their flat. They said that as they lived in a block of flats, the fire could have been a risk to their neighbours. However, the OPSS review concluded that "there is a low risk of harm or injury" from fires in modified machines - a view criticised by campaigners. A spokeswoman for Whirlpool said: ''We welcome the comprehensive and detailed review of the tumble dryer modification programme carried out by the OPSS which has concluded that the modification is effective and that consumers with modified dryers can continue to use them safely. ''Safety is our number one priority, which is why we have taken unprecedented steps to resolve this issue for consumers." However, Caroline Normand, from consumer group Which?, said: "This review is fundamentally flawed and appears to favour business interests over people's safety. "It sends an alarming message that companies failing to deal with potentially dangerous products will not be made to take responsibility." 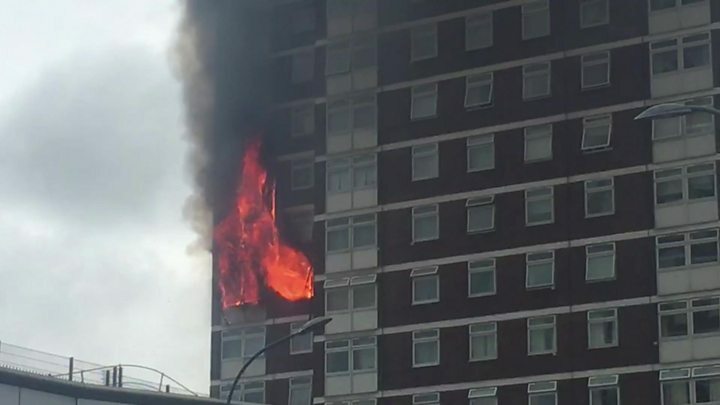 She said that owners continued to report signs of fire in their modified tumble dryers, but the OPSS had "failed to take decisive action" and had instead "thumbed its nose at those concerns". Rachel Reeves, who chairs the Business Committee in the Commons, said: "This was the first real test for the OPSS and yet they have ducked the challenge by using a soft review rather than a rigorous investigation. "The OPSS needs to stand up and be counted when it comes to protecting consumers. If it is not up to the task, then the secretary of state will need to step in and take action on Whirlpool, and on the product safety regime more generally, to ensure consumers get the protection they deserve." Anyone who still owns an unmodified Indesit, Hotpoint, Creda, Swan or Proline dryer manufactured between April 2004 and September 2015 should visit Indesit, Hotpoint or Swan and use the interactive model checker to find out if theirs is affected. Those affected can also contact 0800 151 0905. They should unplug the dryer and not use it.